Aquamate is a privately owned company that started life in the early 1980′s repairing leaking concrete tanks. 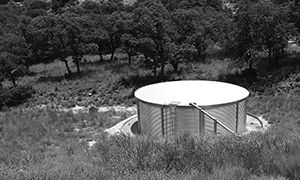 Since 1986, from our facilities in Adelaide, South Australia, we have manufactured and installed poly lined steel tanks across Australia and in several countries around the world. Aquamate was established in 1986 to repair leaking concrete tanks. The concrete tanks were failing due to a variety of reasons including natural ground movement, poor workmanship or lack of correct materials available during installation. A solution to these problems was found in 1986 when Aquamate installed its first kit form polymer lined steel tank. The tank was easily transported to site, constructed in a day in most cases and remained impervious to any natural ground movement. 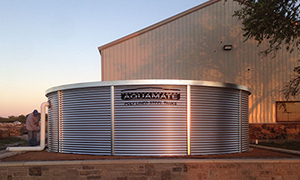 Today, Aquamate supply and install polymer lined steel tanks across Australia and around the world through an accredited dealer network and has established itself as a leader in providing large volume water storage systems. 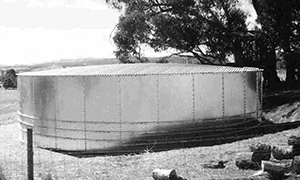 In 2006 Aquamate began manufacturing it’s first corrugated galvansied steel panel tank range. The new tank range evolved from Aquamate’s original flat-walled tank. At the time, Aquamate’s corrugated tank panels were purchased as straight corrugated sheets, curved by hand, in-house, by qualified factory staff. In 2008, Aquamate decided that the quality of the geomembrane liners being purchased were not up the high standard it expected, so the decision was made to manufacture all tank liners in-house to control the quality of the material and the fabrication process. Aquamate’s specialized geomembrane fabrication workshop was opened in Dry Creek, South Australia, making Aquamate the only vertically integrated tank manufacturer in the country, manufacturing their own tank shells, roof structures and geomembrane liners. The newly formed geomembrane capability allowed Aquamate to begin offering factory fabrication services for geomembrane pond lining and floating covers. By the beginning of 2009, Aquamate’s hand curved panels were now being manufactured using automated CNC roll forming machinery, which not only ensured a better quality product but also increased production capacity. These standards reflect the minimum requirement for how we conduct our business however, our own internal continual improvement programs ensure we operate at a higher level than these recognized standards require us to. Aquamate consistently strive to not only meet our customer’s expectations but exceed them whenever possible. This is reflected in our customer testimonials that are provided by real customers, posted on our web site with their written consent, in their own words and supported by a real photo of them next to their real Aquamate tank. In mid-2014, Aquamate consolidated its geomembrane fabrication facility, steel production and administration into a single 60,000 square foot production facility in the southern suburbs of Adelaide, South Australia. Spread across three separate workshops on a 3 acre lot less than 6 miles from the city of Adelaide, Aquamate’s specialized production facility allows it to consistently produce premium water tanks and liners for rainwater storage, well water storage, fire protection storage and a variety of commercial applications.